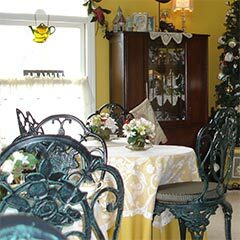 The Tea Salon is quaintly decorated with antiques and authentic period dress forms. This room is an ideal place for a variety of gatherings such as bridal and baby showers, birthday and anniversary celebrations or just an afternoon out with special friends for a relaxing escape from hectic schedules. Tea Grannys & Friends services are available from April - December seasonally. To further enrich your tea experience, we offer an informative Historical Presentation about artifacts from the 1890's. Price includes Tea Experience and interactive demonstration. Perhaps you are not able to join us in person at Tea Grannys & Friends, maybe you are not feeling well, or just need a little ray of sunshine for that someone special! How would you like to send an Afternoon Tea Basket for Two or Four Friends? Basket includes sandwiches, with freshly baked goodies, along with your choice of tea, and a special greeting card? We can most certainly help you with this very unique delivery! Just call Lady Kimberly to make arrangements. Notice of 48 hours is required. Lady Kimberly presents a lively and informative talk of the Victorian era and how it relates to Tea & Etiquette in this romantic period. She will be dressed in period costume and will present a medley of historical artifacts. Personalized place cards are available to enhance your tea settings. Call or email us for pricing & presentation options. Please notify of dietary needs or allergies at time of booking. Due to the nature of our business model we are unfortunately not a gluten or nut-free facility.